With the recent drought in the West, ranchers may be forced to find more sustainable options. And some researchers are looking to a breed of cattle from the past to find the answers. Jon and Susie Eickoff are used to working together and going home together. Jon says that over three decades they have only been apart a couple of times. “Except for a business trip to Houston, Texas and a stint that I spent in the hospital for ten days, I can say that in thirty years those are the only times we have not been together,” said Jon Eickoff. That stint in the hospital was due to a heart attack Jon suffered while being the CEO of a fast-paced successful engineering services company that he managed with Susie. The couple say they decided just years afterward that it was time to leave the “pressure cooker” career and trade it in for a slower-paced ranching life near Faywood, New Mexico. “Being out here in a beautiful place with beautiful scenery and around some nice docile animals, it’s a nice place to be,” said Jon Eickoff. Those animals are criollo cattle. 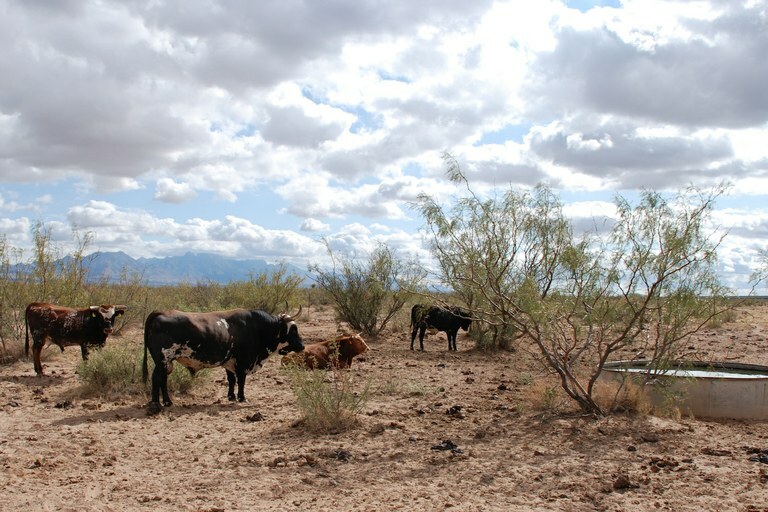 The adaptability of criollo cattle to the conditions of the Jornada Basin is one research focus at the USDA/ARS Jornada Experimental Range near Las Cruces. Susie Eickoff says while trying to decide on a cattle breed, they watched as ranching friends struggled during New Mexico’s recent drought. “Friends of ours had a large cattle ranch and they were selling off their cattle because there was no grass for the cattle, there was no water for the cattle, it was very, very severe on them,” she said. 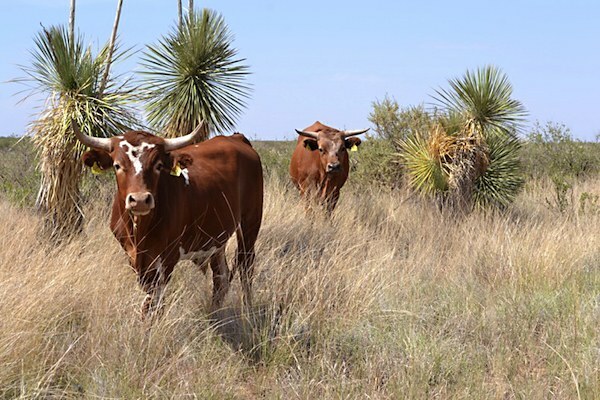 The Eickoffs say they came across research being done on criollo cattle at the U.S. Department of Agriculture’s Jornada Experimental Range that showed the breed could adapt to the arid desert environment in Southwest New Mexico. Susie Eickoff says they read up on a lot of the studies being done on the criollo before selecting a breed that has been in the region for hundreds of years. “This is a sustainable animal. It requires less food, less supplementation, less water, all of those things that the British breeds require more of,” she said. She says that once a rancher goes through the struggles of drought, it’s very difficult to go through it again. “They can survive these droughts and you know, it will get us through the tough times,” she said. Jon Eickoff says that they are lucky to have 141 acres of land with irrigable water. “Water is a premium in this part of the country,” he said. How much of a premium? Research published in the peer-reviewed journal Environmental Research Letters found one in 30 wells in the west is probably dry. The study by Stanford University and the University of California looked at data in 17 western states covering more than two million groundwater wells. In Eastern New Mexico, there is concern in Curry and Roosevelt Counties about increased use of the Ogallala Aquifer. 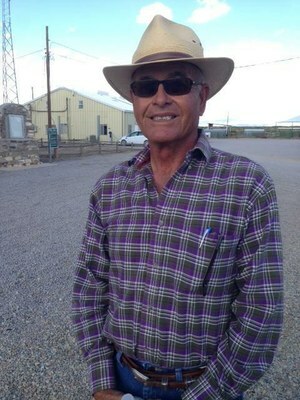 Alex Rineheart, a hydrogeologist with the New Mexico Bureau of Geology and Mineral Resources says he worries about the lack of recharge to the aquifer. “Even if the drought reverses and we end up in wet period for a while, it’s not really going to change anything,” said Rineheart. Rineheart says officials are looking into piping in water to the area as a solution. As for a possible solution for ranchers facing drought, researchers at the USDA’s Jornada Experimental Range north of Las Cruces continue their work on the criollo. Alfredo Gonzalez, animal scientist at the USDA Jornada Experimental Range continues research on the criollo cattle. Alfredo Gonzalez, an animal scientist at the range drives out to check on a group of criollo cattle on the range in a pasture that he says is around 6,000 acres. Gonzalez is comparing how this group of criollo compares to a group of Angus and Hereford crossbred to see how the cattle respond to the desert temperatures. “They seem better adapted to the hot temperatures,” said Gonzalez. Gonzalez says not only does the criollo thrive in the desert temperatures, but by monitoring the cattle with GPS tracking collars, they found the breed can travel further from water. “We’ve found that they go days more without water, again, they are responding by going out further and so they distribute a lot better than the Angus. So those are things that the researchers are continuing to collect data on the breed,” said Gonzalez. That data also includes understanding the criollo’s diet better. He says the breed is helping restore grasslands that have disappeared due to overgrazing in the state. The Eickoffs say the breed of cattle has improved the grasslands on their ranch. Criollo cattle on the Jornada Experimental Range. “Because they’re grazing constantly, they’re spreading seeds for us, they’re fertilizing seeds, even with their small hooves they’re doing very little damage to what’s here,” said Jon Eickoff. The Eickoffs also say criollos birth more easily – they’ve never had to pull a calf – and the breed seems to be great at avoiding disease. It’s another insurance policy for this three-person ranching operation facing conditions that ranchers in the West continue to deal with. “I’m not a pessimist, I’m just a disillusioned optimist. It’s really difficult to look into the negative side of things, but if it does go negative, I’m sure going to be glad there is going to be criollos around,” said Jon Eickoff. A breed that has been around hundreds of years, may offer sustainable answers for ranchers in the West.